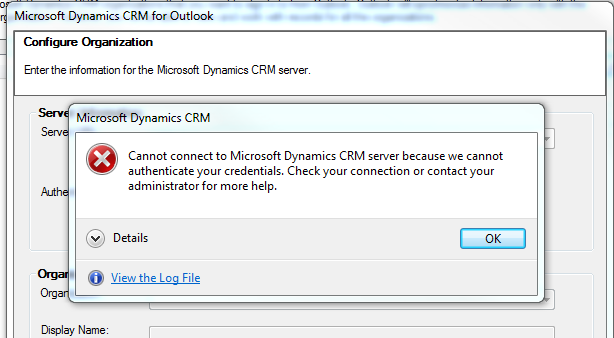 After installing the CRM Dynamics Outlook client, you may see an error indicating that your credentials can't be authenticated by the CRM service even when you know that your credentials are correct. When this takes place, we need to look at what service your work station is trying to connect. When prompted by the configuration dialog, we should select the CRM Online entry. This allows the plugin to try to connect to disco.crm.dynamics.com. This is the url where the client should get authenticated. We should now look at the Generic Credentials section.There is a list of credentials that end with the crm.dynamics.com domain name. You can expand the list and see what kind of credentials are being used. The best way to clean this up is to expand each entry and remove it from the vault. This way we can start the CRM configuration wizard again and select CRM online for the server URL option. Once the credentials have been accepted, we should be able to see the organization name from the list. At this point, the connection should be successful and the CRM plugin on Outlook should be working as expected. I hope this saves you some time and resolves this problem.